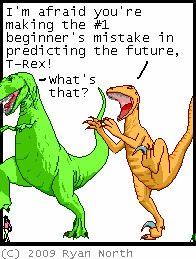 Some of you may already follow Ryan North’s Dinosaur Comics; those who don’t should give it a go for a few weeks. The po-mo mock philosophy isn’t to everyone’s taste, but it usually gets at least one genuine LOL a week out of me. The latest iteration made me grin, because it seemed so apposite to yesterday’s post about the Stross/Anissimov disagreement. So click through and see the whole thing. Philosophy and dinosaurs – what more could you ask for on a Friday?